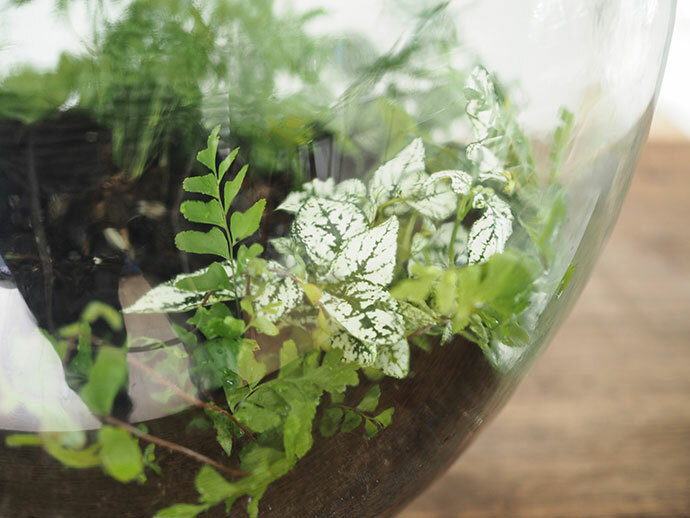 Way back when, my mother-in-law gave me a beautiful glass carboy that had used to belong to her mother with the challenge to plant it up as a terrarium. 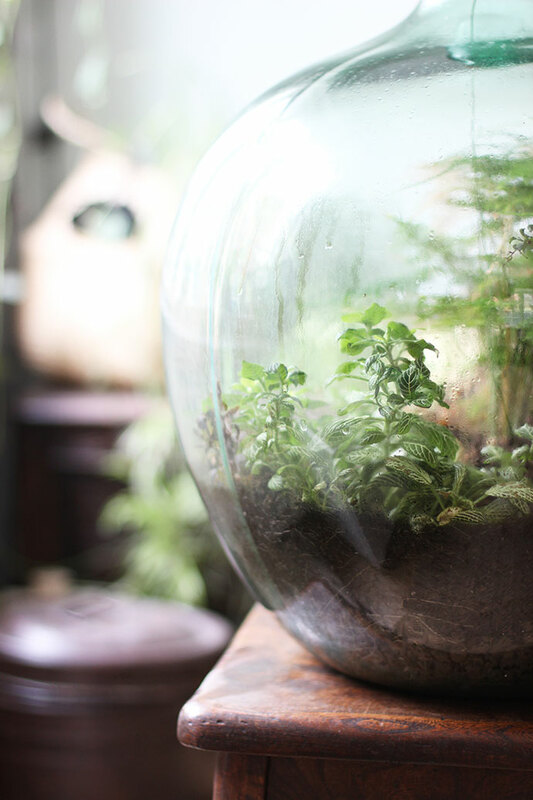 Not quite sure how to go about it, I put it off for years, happy just to have the empty carboy out on display instead, but after attending a terrarium workshop, I finally felt brave enough to give it a go and over a year on (sealed the whole time), it’s still alive! 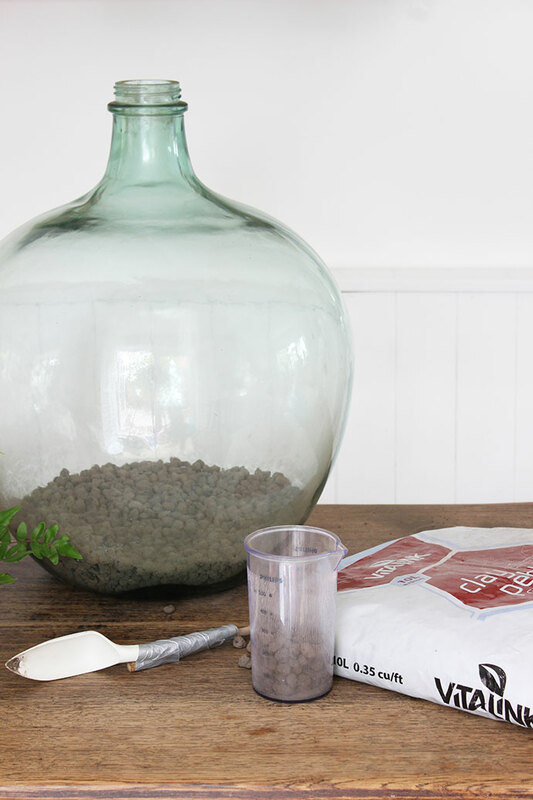 Pour a good layer of clay pebbles into the carboy (this provides essential drainage for your terrarium). You want at least a couple of inches. 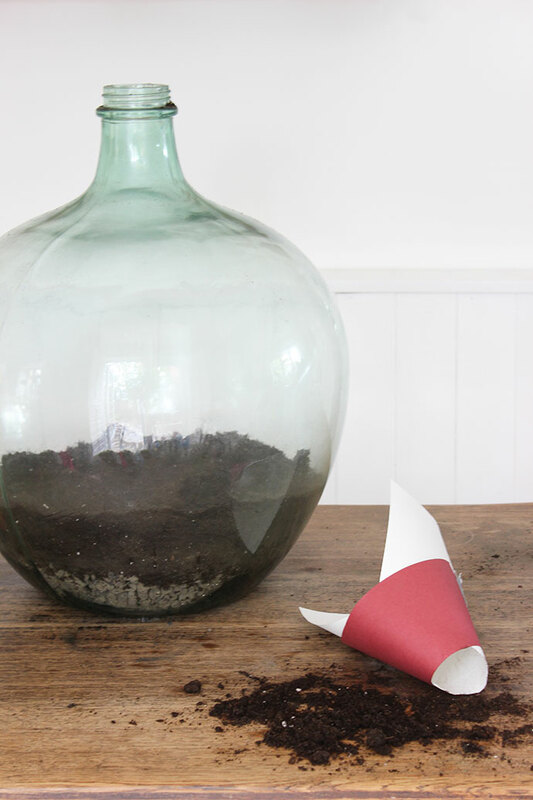 Pour in your soil – I just used regular indoor plant compost. I made a funnel out of a piece of card to help get the soil into the narrow neck of the carboy, and kept adding soil until there was a depth of about four inches. This is the really tricky bit, because the neck of the carboy is so narrow, and the soil bed is a long way down! I taped a small spade onto a length of bamboo cane, but you could do the same with a dessert spoon (or similar), and inserted this into the carboy to awkwardly dig out a small hole. 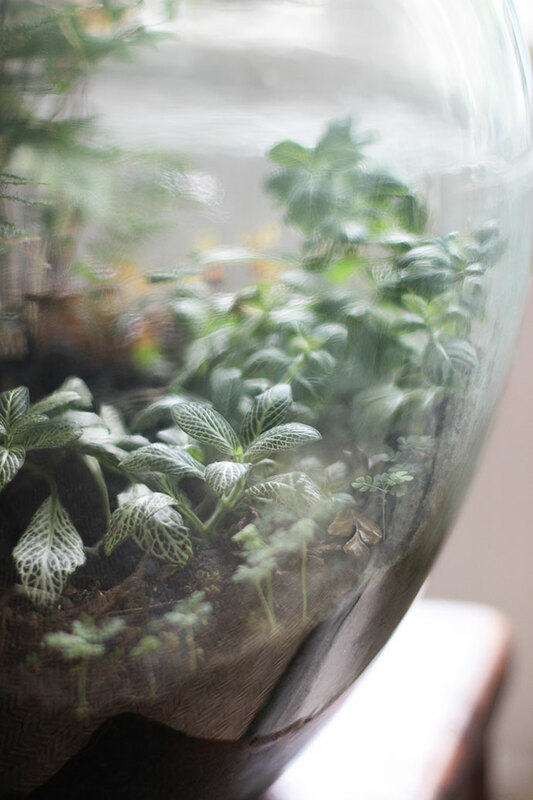 I’ve also read that you can lower the plants in on a piece of wire or string. 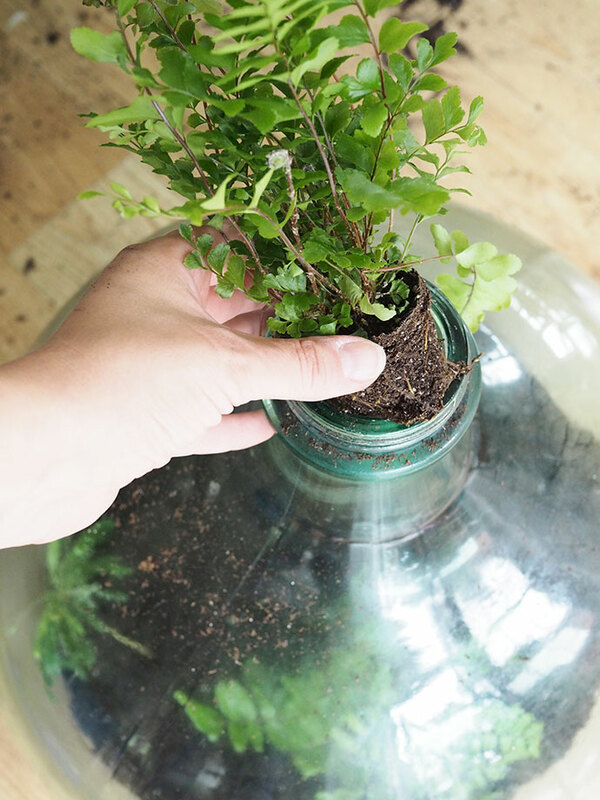 I thinned out the plants until they could squeeze through the opening, and then carefully dropped them in. Then I used the trowel to try to manoeuvre the plant into the hole, and move spread soil around the hole as much as I could. I tried pressing the plants in place but found this impossible! 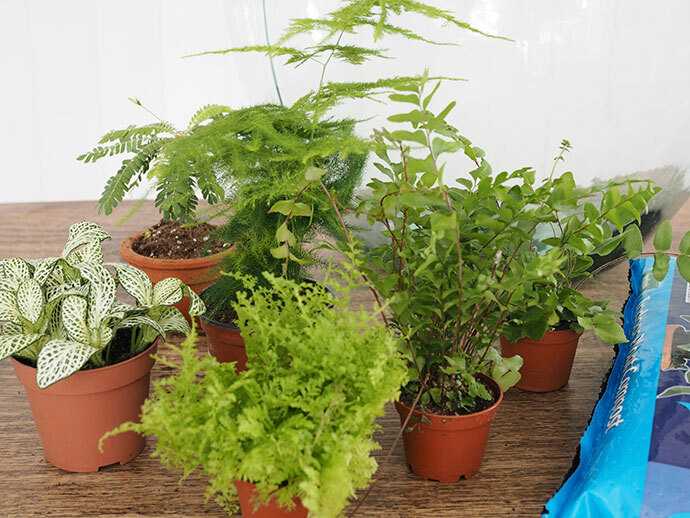 In my workshop we tried to think about the heights and arrangement of the plants. 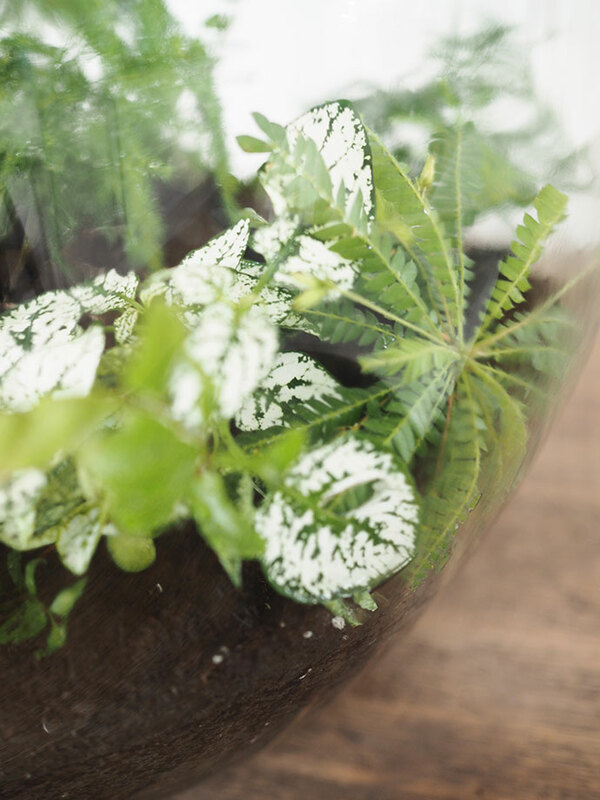 The best I could achieve when it came to such an awkward container was to put the smaller plants towards the edges, and finish with a couple of taller ferns in the centre. 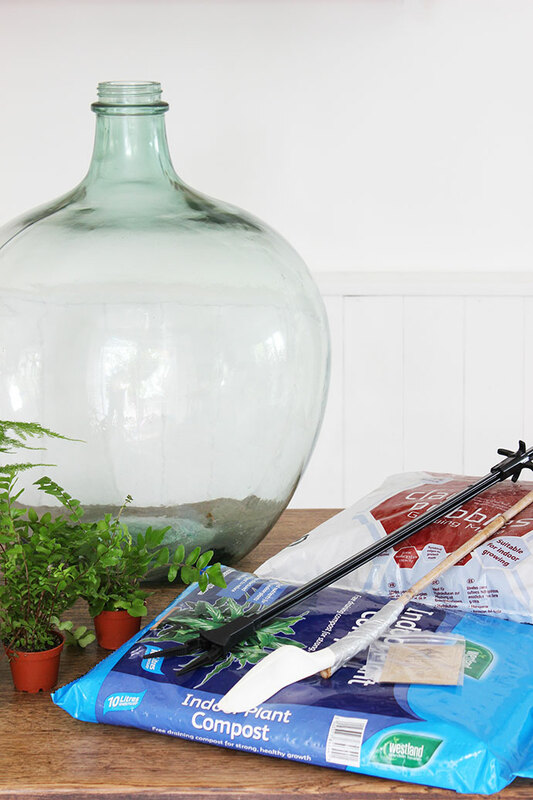 Use a watering can to pour in a generous amount of water. I then sprinkled the moss spores in, but unfortunately these never actually grew into moss. 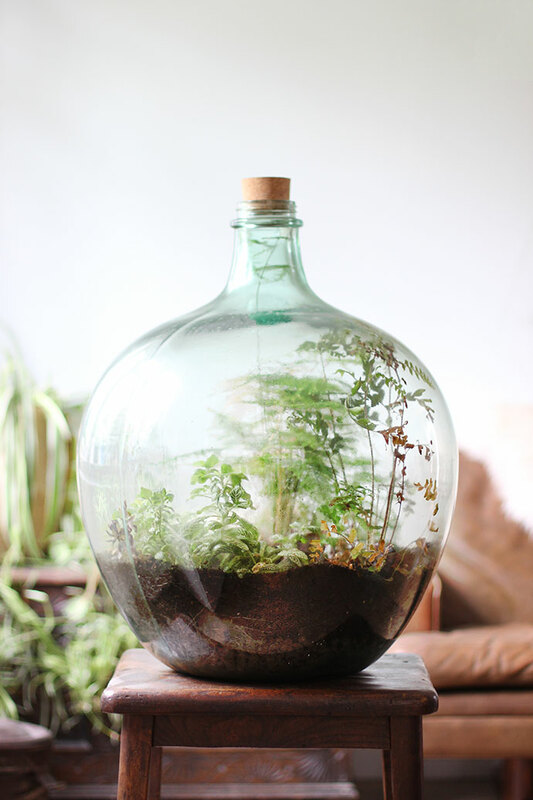 Once you insert the cork stopper in the top, you’ve sealed the garden and it will act like a mini eco-system – the plants and the soil release water vapour, which then collects on the inside of the glass and runs down back into the soil so the water is endlessly recycled, without you having to open the terrarium and add anything yourself. 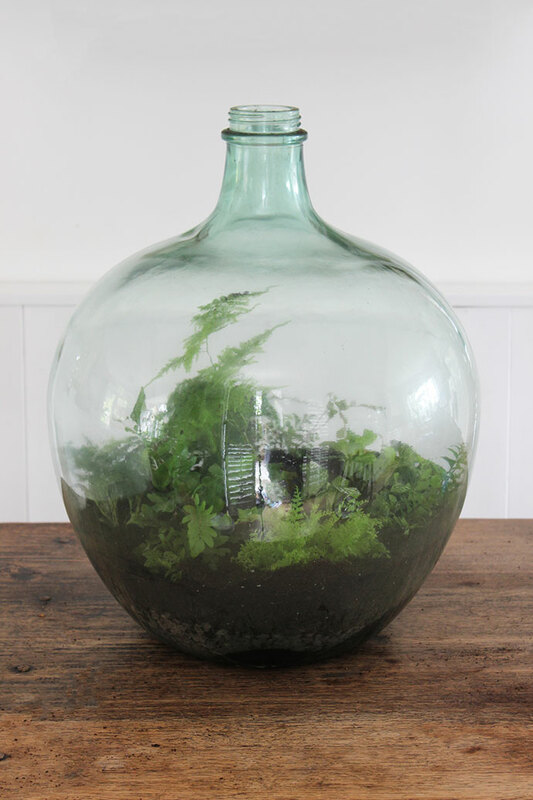 Over a year has now passed since I sealed up the carboy, and most of the plants in the garden are thriving, although some (including the boston fern) and haven’t fared so well. But this is ok, as those dead leaves will just end up breaking down in the soil as they do in a normal ecosystem. 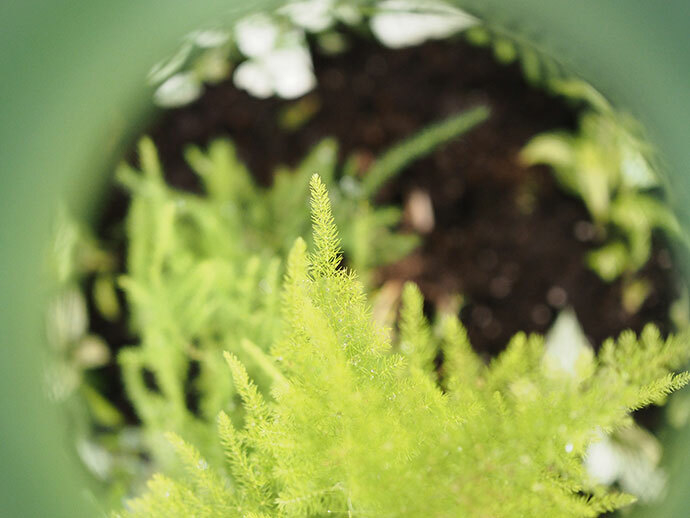 The plants that are happy in my little closed garden are starting to spread out to cover the soil, and the tall fern in the centre is fanning out above. 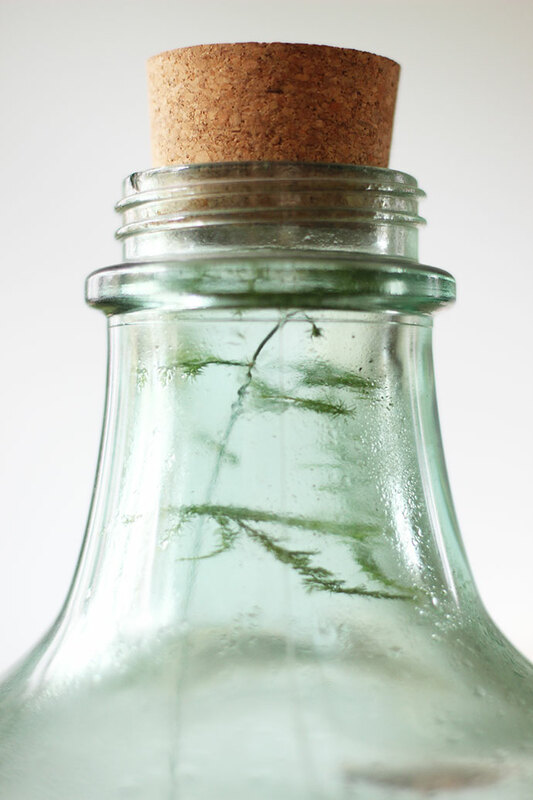 I haven’t unsealed the bottle since I planted it, so it’s amazing to see that those seedlings have grown. I’ve read a news report about a sealed bottle garden that’s thriving after 53 years, having only ever been watered once. I wonder how long mine will live for! Cool! I love this! Maybe I try it myself!